There’s nothing better than crisp-crusted, cheese-bubbling pizza fresh out of a brick oven. But, when that goes into a box only to lose its crispness as each minute passes while being transported to my house, it’s not the same anymore. So, for pizza at home, I’d rather make my own. Every other week or so, on Friday evening, I’ll whip up my usual dough recipe, let it rise while doing other things, roll it into a big pizza-ish shape, and top it with tomato sauce, mushrooms, olives, and maybe spinach, or whatever other vegetables are sitting around and seem like pizza material, and cheese. But, since reading A16: Food + Wine , I’ve wanted to try the method presented in that book. It’s classic Neopolitan pizza, and there are instructions for the dough, the very simple sauce, and just a few topping options. 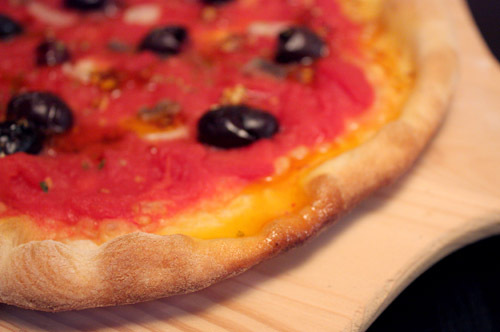 The idea of classic Neopolitan pizza was reinforced when I read April’s La Cucina Italiana. And, that meant it was time to change up my routine. Following the A16 process, I started the dough a day early. The dough was mixed, kneaded, and then left in an oiled bowl in the refrigerator overnight. The next morning, the dough was punched down and turned in the bowl, and then returned to the refrigerator until ready to make pizza. The second refrigerated resting time can be anywhere from four to twenty-four hours, and I left it for probably nine hours. It was then turned out onto a floured surface and divided into four equal parts. Those were shaped into balls and left to proof for a couple of hours. I could tell right away that this dough was different than my usual. It had a nice, supple, springy feel to it. To shape the dough into pizzas, Appleman suggests flattening the ball of dough with your fingertips and then using the palm of your hand to press in the center. By pressing with your palm and turning with the other hand, you should get a flat circle with a slightly raised edge. Right. I couldn’t make it happen. I ripped holes in the dough and ended up with a raggedy, uneven, odd-shaped mess. I resorted to my rolling pin. The next step in the process was the sauce. I don’t know why, but it had never occurred to me that the fresh, light sauce I’ve loved so much on pizzas in restaurants was uncooked. To make the sauce as described in the book, you open a can of San Marzano tomatoes and pour them into a bowl. Squish them with your hands until the tomatoes are broken into small pieces, and add a little sea salt. That’s it. If the canned tomatoes are watery, pour off some water before you begin squishing. For toppings, I decided to try the pizza romana. The dough was spread evenly with some sauce, very thin slices of garlic were layered on top, some chopped anchovies were scattered about, pitted black olives were added, and a sprinkling of dried oregano finished it. This went onto a baking stone in the bottom of a 500 degree F oven for about seven minutes. When finished, it was drizzled with chile oil. Unfortunately, I did not locate good, salt-packed anchovies and had to get by with olive oil packed ones. Also, there were no jarred Calabrian chiles to be found, so I made the book’s version of chile oil with dried chile flakes instead. The last time I cooked from this book, I mentioned the wine pairings that appear with each recipe. This time, the suggested wine was a Falanghina from Campania which I actually did find. I even snapped a photo of the label (above) so I would remember the name. This was definitely better than my regular pizza. The dough had developed more flavor from the longer, slower rising time. Of course, it lacked that amazing wood-fired flavor of a great pizza, but I’m just comparing it to my typical, homemade version. The chile oil was a knock-out. It was a rare pizza experience during which I didn’t miss the cheese. The simple sauce was perfect. That’s all a pizza sauce needs to be. 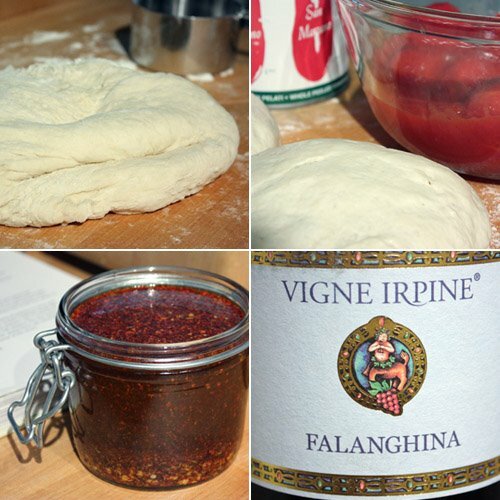 And, the wine worked very nicely with the spicy, salty pizza toppings. The Falanghina was a balanced wine with a little crispness but also good body. It wasn’t as crisp as a Sauvignon Blanc and not as buttery as a Chardonnay, but it fell somewhere in between and deliciously so. I may not think to start my pizza dough a day early every time from now on, but I’ll definitely be making this again. The sauce will likely become my new standard. Also, the remaining chile oil should last a few months in the refrigerator, and then it will, without doubt, be replenished. I used the remaining dough to make a few other pizza variations. One of my favorites, not from the book but just a combination I like, was thinly sliced summer squash with mushroom, dill, and mozzarella, and that one is shown below. Gosh, this photos make my stomach rumble. Delicious pizza Lisa! sweetness precious louise these look ace! wow...I feel like I should tap dance or something...the crust...oh look at that crust! Those pizzas do not look like the state of Texas but your comment made me laugh anyway. I love the idea of make ahead dough. I never make pizza for parties because I can't deal with the stress of timing the dough rising with dinner. Problem solved. I also really like pizza without cheese. I like to be able to taste the crust and the sauce - sometimes cheese just gets in the way. Never tried anchovies on pizza, but sounds so appetizing! The photos here are impressing! I LOVE how your crust came out. Not oily like those other place. You've got my mouth watering now. i wish I had a slice of this rather than a salad. This pizza recipe is inventive and quite outstanding. Thank you! The crust is the best part of the pizza! Put out a bowl of sauce and hand over the crust for dipping. Your crust looks crispy and perfecto. Great looking pizza...thin crust...just love it! The pictures look so yummie. By the way, thank you so much for visiting my site. I would so rather make pizza at home too...if I have you beside me that is! your pizzas put Papa Johns, Dominos, Pizza Hut, and any other self-proclaimed pizza parlors out there to shame! 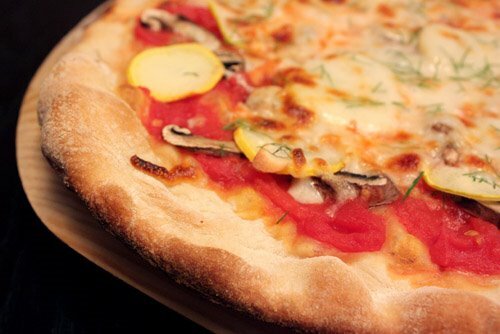 There is NO better pizza than pizza with a thin, crispy crust! homemade pizza is one of the best things ever. you did a great job,both of those pies are mouth watering. It's been too long since we made some pizza for dinner. This looks so good! I make homemade pizza all the time, at least a few times a month. So easy and delicious. That is one perfect looking pizza! The crust looks just so wonderful! I love homemade pizzas, after I have made them myself, I seldom have pizza in restaurants anymore. Yours is beautiful, thin crust is the best isn't it? I love A16! And I love the cookbook - haven't tried the pizza yet, looks like I need too! Oh, you had me at " crisp-crusted, cheese-bubbling". The fact that you ended that description with the word "pizza" only sealed the deal! Such vibrant colors -- I love food that makes your eyes hurt, in a good way. You're getting awfully good at breads -- very impressive! lovely pizza, lisa! you're so right--delivery pizza leaves a lot to be desired and can't come close to comparing to homemade. bravo. I love homemade pizza, yours look great and delicious! Lisa, yours turned out so great. I'm with you, I like a crispy thin crust, and it never comes like that when you do take out. My sister has a pizza dough recipe with no rise involved that turns out thin and crispy dough. If you want I can e-mail you the recipe! This looks delicious Lisa! I am not a huge pizza-fan, I have to confess, but maybe I would be if I started making them myself! that crust looks so, so perfect and golden! i love olives on pizza!! mmm. This is one great looking pizza! And a homemade crust as well! Great photos!! I can feel the crispness of the edges of the crust just looking at the pictures. You've inspired to make my own pizza too. You put so much time and care into the dough-making. They both look so delicious. Honestly, I think I would miss the cheese, just a little! Look at that pizza dough! I love the crispy crunchy edges of Italian pizza. wow girl! your pizza looks just like an italian one! Well done. Fantastic pizzas and many, many thanks for the tip about the fresh sauce! I will definitely try that for our next pizza. I, too, was amazed the first time I made this pizza recipe that one could have such sublime sauce from just tomatoes out of the can that you squish with your fingers. Just shows how the simplest things in life truly are the best. Lisa, I agree with you on the delivered pizza not being so crispy by the time it's delivered. I've also started making pizza at home and it does not make me miss commercial pizza at all. Your pizza looks really good.